A pen is mightier than the sword they say. In the age of computers and tabs, the feeling of writing in a brand new book is something else altogether. The smell that fills your senses with each page is magical and hypnotic. Since my childhood, I have had the habit of writing and maintaining a diary. It gives me immense pleasure, when I write down my thoughts and feelings in a book. Typing a journal does not hold a candle to writing in your own handwriting. When the nib of a pen touches an empty paper, it has the power in it to make or break the content. The words that flow from the pen write a story and create characters. Feelings are then splattered in the page as emotions shape up to form lives. The hand glides smoothly along the page singing with the written word. Years later, when you flick through the pages of the book, you would relive the story in your own words and writing. A hand written later till date rates higher in the equation of love when compared to an e-card or a diamond ring. There is something extraordinary about the written word that no technology or font can match up to. Your own handwriting, be is calligraphic or almost illegible shall always remain close to your heart. For me, writing is sharing and the art of writing is the art of discovering what you believe. Writing is an extreme privilege but it's also a gift. It's a gift to yourself and it's a gift of giving a story to yourself and to others. To the world. A glossy computer screen can never match up to the rawness and the feel of writing on good old paper. Knowing that the written word cannot be erased is a strange yet powerful feeling. A backspace and the story can be erased in one shot. But once it is hand written, no matter how much you erase it, some remnants remain. It is embedded somewhere or the other. 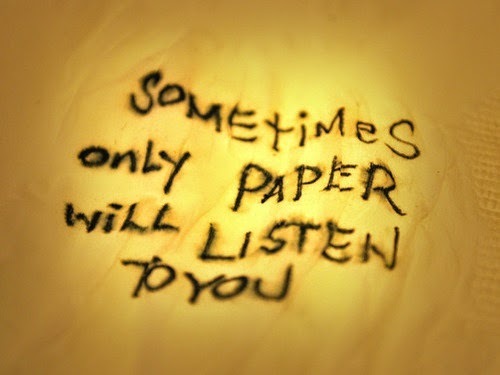 There is something extremely powerful about the written word, knowing that it cannot be taken back. Although it is not engraved in stone, the impact of it remains. Almost forever. I was introduced to 'Matrikas' by Knitha. Matrikas Paper Products presents you with the premium space to stimulate your mind and unleash your creative best. Their range includes exquisitely designed and finished journals, diaries, notebooks and other stationary. Matrikas gets its name from the Sanskrit word for mother, denoting pure love and powerful energies. I am a person who was always into writing. I have a huge collection of books and diaries. But when I saw the Matrikas products I was blown away. These are not just plain and mundane books. A lot of thought has gone behind each and every book and it shows. The books are crafted with a lot of care and of course love. When I visited their site for the first time I saw a diary which had a ship, a compass and a globe on its cover. I was drawn to it in an instant. The cover spoke to me and wanted me to write its story. The ship looked tired, but held on its own fighting the long journey successfully. The compass acted as the perfect companion gliding the ship carefully across the globe. Anybody else might find this silly, but the people at Matrikas did not. 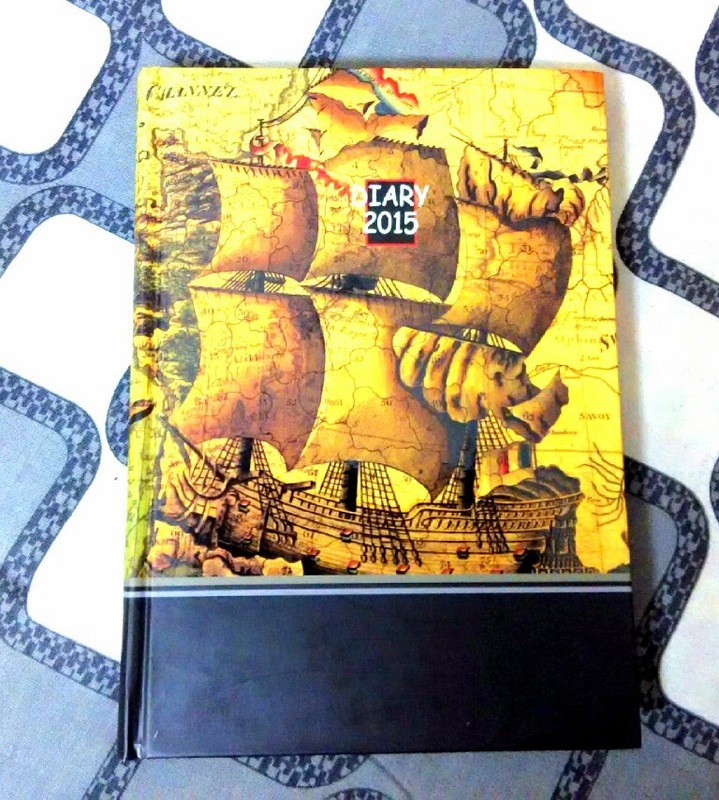 When they sent me their products for review, this diary was among it too! I was thrilled and touched. The products came to me neatly and individually packed in a cardboard box. I thought that I might get only one book for review, but I received four stunning books each one different from the other and standing out on its own. 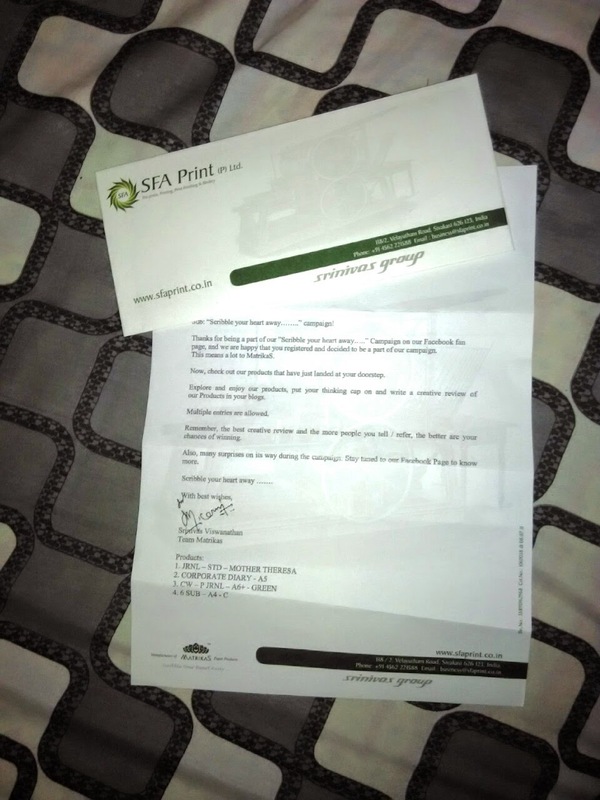 Along with the books came a personalized letter, thanking me for being a part of this campaign. cover for holding your important documents related to the data you are writing in this book. The pages are white and ruled, making it easy to write with a free hand. It has a satin page marker for you to bookmark your page. The book is compact and easy to carry around in a small bag. Diary 2015: Like I said above, this book for me symbolized hope. The ship on the printed laminated metallic cover along with a compass in the backdrop of a globe, was fascinating. The diary has individual pages for each day of the year along with inspiring quotes at the bottom of each page. At the beginning of every month it has a monthly planner and at the end of the diary it has an yearly planner too. This is the perfect diary for me to jot down the events of a day for reference later. Mother Teresa Journal: While filling up the registration for this campaign, I was asked who was my inspiration. On an impulse I had said Mother Teresa and before I knew it they had sent me the Mother Teresa journal. 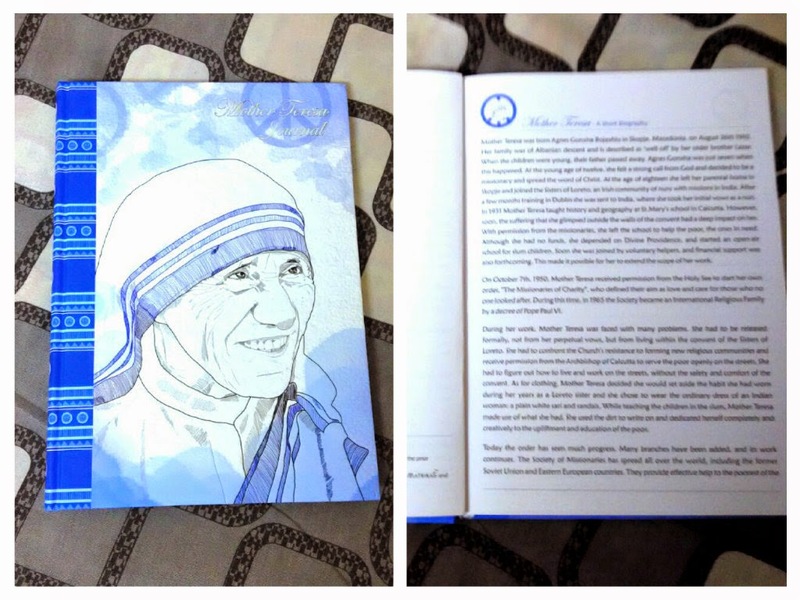 The hard bound cover has a velvet touch to it and the white and blue cover perfectly complimented the image of Mother Teresa. The first page of this book is a short biography of her. The following pages surprised me with space for 'Books to be read', 'Works to be accomplished' and 'Places to be visited'. I had never seen such headlined books before. This was amazing! The following pages were monthly planners with a to-do list and a one dimensional pin board to jot down important points. Every other page has quotes by the great personality herself. I cannot wait to start using this one. Toss & Turn 6 Subject Note Book: This hard bound metallic cover has a special effect with ludo embossed on it. Yes ludo, the age old game. 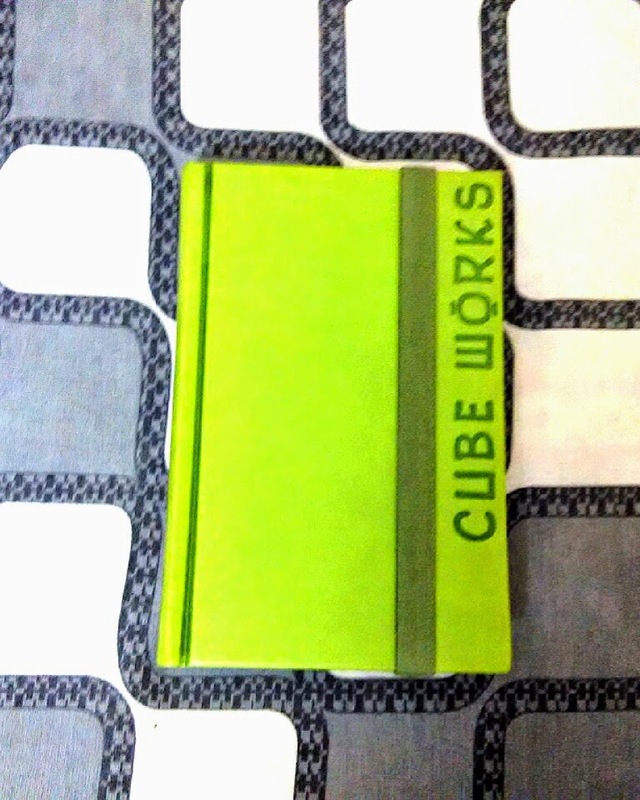 The book is divided by colored partitions into six. So you can use one partition as a journal and one of the other partitions to store your secret recipes or poems. 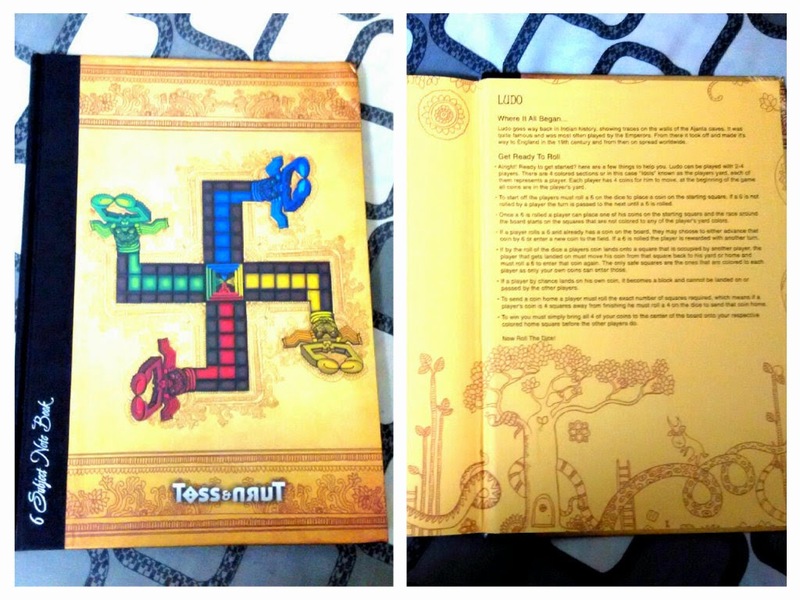 The last page of the book has the history of Ludo written on it making it an interesting read. This book can hold a lot of data and thanks to the awesomely designed cover you can carry it in your hand and flaunt if off! The pages of each book is thick and smooth. The pages don't blot nor do they smudge, making it a wonderful writing experience. To hell with the notes app on my phone, I now know where to put down all my thoughts. 2014 has not ended yet, but I know that 2015 is going to be great, and I'm going to write down every act of my life in my diary. Years later when I read it, I want to have a smile on my face. I am an avid blogger and thoughts crowd my head every second. And now I have enough books to fill them. Books for me have always been a vital part of my life as it holds my life inside them. Books are a piece of my heart, beating to tune of my pen and dancing to the chimes of my words. My books are like my babies too and I take care of them with pure love and concern. Just like a mother, making me a Matrika too! I would refer this brand to everyone. The book is worth the price and will soon become a part of you. Check out their site here and their Facebook page here. I assure you, you will not be disappointed. lovely diaries! I write a diary too and the joy of writing with your fav pen in a secret diary is too much to describe! So cool some of them are! However, I don't prefer buying branded diaries much. I make my journals and scrapbooks myself with craft stationeries and it makes me all the more excited about writing in it. I ever maintained a diary but yes I wrote whenever and wherever I could. There is something about writing in your own handwriting than typing it on a laptop or tab. The products do look interesting! They are, do check them out! Im not a diary person at all. However these look good enough to gift a close friend who writes. I love the feel of pen on paper! Beautiful diaries! You should try these out!